Education: He holds Diploma in Computer Programming/Programmer, Higher National Diploma (HND) in Software Engineering, a B.Sc. (Hons) in Computing from University of Huddersfield, an M.A (Master of Arts) in ICT and Education from University of Leeds, Doctor of Philosophy (PhD) in Geo-informatics and Space Technologies at Cyprus University of Technology. He holds many professional certifications, including the Microsoft Certified Trainer (MCT), Microsoft Certified Application Developer (MCAD), Microsoft Certified Application Specialist (MCAS), Adobe Certified Associate (ACA) for Adobe Dreamweaver and Adobe Photoshop, ECDL Certified Trainer Professional (ECDL CTP) and ISO/IEC 27001 Lead Implementer. Professional background: He is Software Developer, IT Instructor and Consultant. 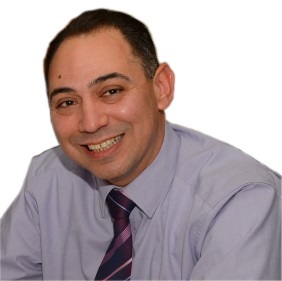 Additionally he is Research Associate at the Cyprus University of Technology ’Eratosthenes Research Center’. Memberships: He is a member of the Cyprus Computer Society, member (MBCS) of the British Computer Society and member of SPIE (international society advancing an interdisciplinary approach to the science and application of light). Research: His research focuses on the detection of buried structures using space & GIS techniques for security & defense applications. 2015 - Esri European User Conference (EUC), October 14–16, in Salzburg, Austria Subject: Exploring the Importance of Integrating GIS with Satellite Remote Sensing and Field Spectroscopy for Military & Security Applications in Cyprus. 2016 - Fourth International Conference on Remote Sensing and Geoformation of Environment' (RSCy2016), April 2016. 2016 - SPIE Defense + Security conference, April 17 - 21, In Baltimore, USA Subject: Integrated use of field spectroscopy and satellite remote sensing for defence and security applications in Cyprus. 2016 - SPIE Security + Defence Conference, September 26- 29, In Edinburgh, Scotland Subject: Importance of using field spectroscopy to support the satellite remote sensing for underground structures intended for security reasons in the eastern Mediterranean region. He is the author of two books: one for ECDL Web Editing – Using Adobe Dreamweaver and another one for ECDL Image Editing – Using Adobe Photoshop which have been approved by Ministry of Education of Cyprus, by Cyprus Computer Society and ECDL. These books are taught in schools (secondary education) in Cyprus. Melillos, G., Themistocleous, K., Papadavid, G., Agapiou, A., Prodromou, M., Michaelides, S., Hadjimitsis, D., (2016): Integrated use of field spectroscopy and satellite remote sensing for defence and security applications in Cyprus. SPIE Proceedings Article, SPIE Defense + Security (SI16D), Baltimore, USA. Melillos, G., Themistocleous, K., Papadavid, G., Agapiou, A., Prodromou, M., Michaelides, S., Hadjimitsis, D., (2016): Integrated use of field spectroscopy and satellite remote sensing for defence and security applications in Cyprus. SPIE Proceedings Article, Fourth International Conference on Remote Sensing and Geoinformation of the Environment (RSG16), Paphos, Cyprus. Melillos, G., Themistocleous, K., Papadavid, G., Agapiou, A., Prodromou, M., Michaelides, S., Hadjimitsis, D., (2016): Importance of using field spectroscopy to support the satellite remote sensing for underground structures intended for security reasons in the eastern Mediterranean region. SPIE Proceedings Article, SPIE Security + Defence (ESD16), Edinburgh, Scotland.